Encore Equestrian Center is a very beautiful facility. We have 10 stalls, a heated tack room, and an 60 X 120 indoor arena. We also have a large outdoor arena, round pen, cross country course, and many trails for our use. 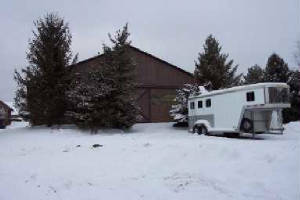 Our pasture is a rolling three and a half acres with two seperate large run-in sheds and an electric waterer. We have plans to split the pasture in the spring in order to be able to seperate the herd in different ways to meet the needs of all the horses at our barn.